A red light photo enforcement sign is seen below a red light camera Tuesday, Dec. 16, 2014, in Lawrence Township, N.J. It and others across the state went dark when the five-year pilot program ended later that month. Jay Lassiter drove back home to Cherry Hill last month after burying his Marine Corps veteran father at Arlington National Cemetery. A few days later, he got a surprise in the mail. It was a message from Washington. And it wasn't a sympathy card. It was a speeding ticket. Two more had come by the end of the week. The Metropolitan Police Department said cameras had caught his Audi speeding on New York Avenue (twice) and on Rhode Island Avenue. He owed $400. Yeah, he was speeding, he said, but in his opinion at least, a 35-mph speed limit on one stretch of road felt as if it should have been set at 55 mph. And besides, this never would have happened back home. New Jersey doesn't have automated speed cameras. The nation's capital, armed with his license-plate number, was able to ticket Lassiter by getting his name and address from his home state — the usual practice nationwide. 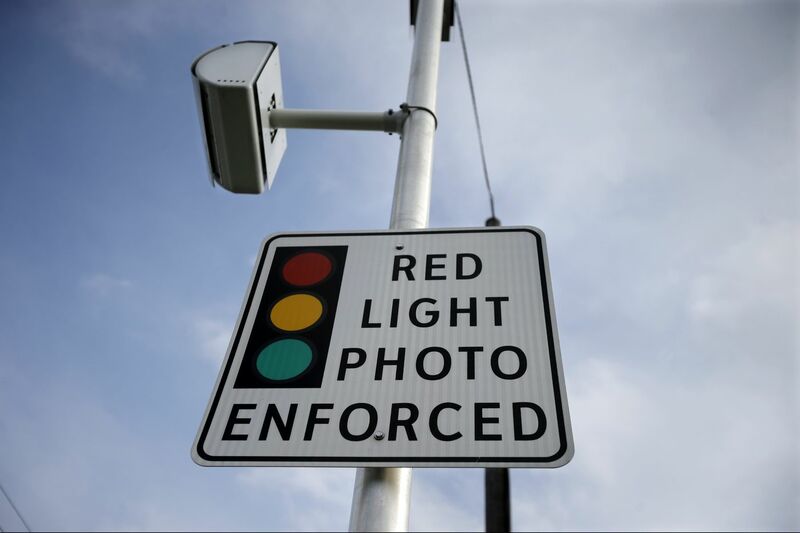 But if a few New Jersey lawmakers get their way, the state's Motor Vehicle Commission will stop giving residents' identifying information to out-of-state agencies — including those in Pennsylvania and New York — trying to cite drivers for speed- and red-light camera violations. South Dakota did the same four years ago. New Jersey ended its five-year red-light camera pilot program in December 2014 after 25 communities recorded hundreds of thousands of violations. The state did not renew the program. The cameras are controversial. Officials in communities that have them say they promote safety and discourage drivers from running red lights. Those with laws banning the cameras say the devices are more about making money than safety and infringe on driver's rights. Both perspectives have support from traffic studies — depending on who was funding them. Judges across the country have thrown out tickets. In 2012, the Chicago Tribune uncovered a bribery scheme between one red-light camera vendor and a city official. The number of communities across the country that use red-light cameras has been falling. In 2012, more than 530 communities used them, according to the National Conference of State Legislatures. About 420 have them now, according to a September report by the Insurance Institute for Highway Safety, which supports the cameras. Twenty-three states and the District of Columbia use red-light cameras, speed cameras, or both. New Jersey ended a pilot red-light camera program in 2014. In Pennsylvania, only two municipalities use automated red-light cameras — but one of them happens to be the biggest city in the state. In Philadelphia, 32 intersections have them, and in Abington Township, Montgomery County, three. Both municipalities send all net income to PennDot, which uses the money for safety grants across the state. The city issued more than 215,000 citations between April 1, 2017, and March 31, according to an August report by the Philadelphia Parking Authority. The city amassed over $20 million in revenue and $11 million in profit from the cameras. Philadelphia started using them in 2005. In the fiscal year that ended in March, the parking authority sent just under 10 percent of its red-light violations to New Jersey license-holders; Pennsylvania tag-holders constituted the majority. A bill allowing speed cameras in certain areas is making its way through the Pennsylvania legislature. Philadelphia's parking authority has agreements with out-of-state agencies, including New Jersey's Motor Vehicle Commission, that allow access to driver databases for purposes of issuing red-light camera citations, PPA spokesman Martin O'Rourke said. "If that were to stop then the PPA would have no ability to get the owner's vehicle information or address to send him or her a notice of violation," he said. Sue Fulton, chair and chief administrator of the New Jersey Motor Vehicle Commission, declined to comment. State Sen. Nicholas Scutari (D., Union), who has cosponsored the bill with State Sen. Nicholas Sacco (D., Bergen) since 2014, became deputy majority leader this year. He said he thinks they "might actually be able to get some movement," citing bipartisan support. State Sen. Declan O'Scanlon, a Republican from Monmouth County who cosponsored this year's bill, said he's not worried about the previous stalling of the legislation. "The best thing [we] have going for us is time," he said. "Because every single day people get these tickets and realize they're a scam." Local governments in 14 states and the District of Columbia use speed cameras, according to the National Conference of State Legislatures. The nation's capital and communities in 23 states use red-light cameras. South Dakota, which does not allow the cameras, did in 2014 what New Jersey legislators have been trying to do. Whenever an out-of-state agency asks South Dakota for a driver's information for a traffic camera citation — which state officials acknowledge is rare — the state declines the request. Only one state at its border — Iowa — allows the cameras. New Jersey is surrounded by states that have red-light cameras, speed cameras, or both. "If we don't believe in the program as it stands in New Jersey," Scutari said, "why should we help to prosecute our motoring public that resides in New Jersey?"